Indian Code Talking was not new to WWII. There were Cherokee code talkers working for the British in WWI. And when the USA got involved, Choctaw code talkers were with the US Army in Europe. Hitler sent an anthropological team to investigate American Indian tribal languages, but found there to be so many dialects that nothing came of the effort. Yet this caused the Army to be afraid of widely using code talkers in Europe. The fundamentals are to give code names to everything of importance and then convert into native language. Thus a tank was coded as a turtle, which in native language is a strange word to a non-member of the specific tribe. Vulture was a bomber, pregnant vulture was a loaded bomber coming at you. The familiar Able, Baker, Charley, Dog phonetic alphabet became Ant, Bear, Cat, Deer and then into native words. Thus there is a double encryption, first the code words, then the native translation. Whereas it may take a half hour for an order to be encoded, transmitted, decoded and taken to the intended officer, when spoken in code talk takes 20 seconds. Recall it took 8-hours for a message from a patrol plane that the Japanese fleet was coming, to be routed throughout the South Pacific before reaching the Admiral in charge a half hour after the biggest US naval defeat of WW2. Code talking was not only unbreakable, it was also reliable by preventing deceptive, false messages. The Meskwaki code talkers were formed before the war and were ready for the first big operation, the invasion of North Africa. The Marines originally used Basque code talkers in the Pacific, but there were not enough men available, and Navajo code talkers were substituted. 29 Navajo men had trained together in May 1942 and eventually they trained an additional 400 who saw valuable service in the later Pacific campaigns, notably Okinawa. Fourteen Comanche code talkers landed in Normandy. Navajo code talkers continued in Korea and into the early Vietnam period. Congress awarded a gold medal to each tribe that contributed code talkers and silver medals to surviving code talkers. -- An impromptu talk taken from Wikipedia. Interview with Donald Wanatee, Sr, Meskwaki (Sac & Fox) Tribal Council Member and stepson of a Mesquakie Code Talker, Marshalltown (Iowa) Historical Society, 16Aug2012. 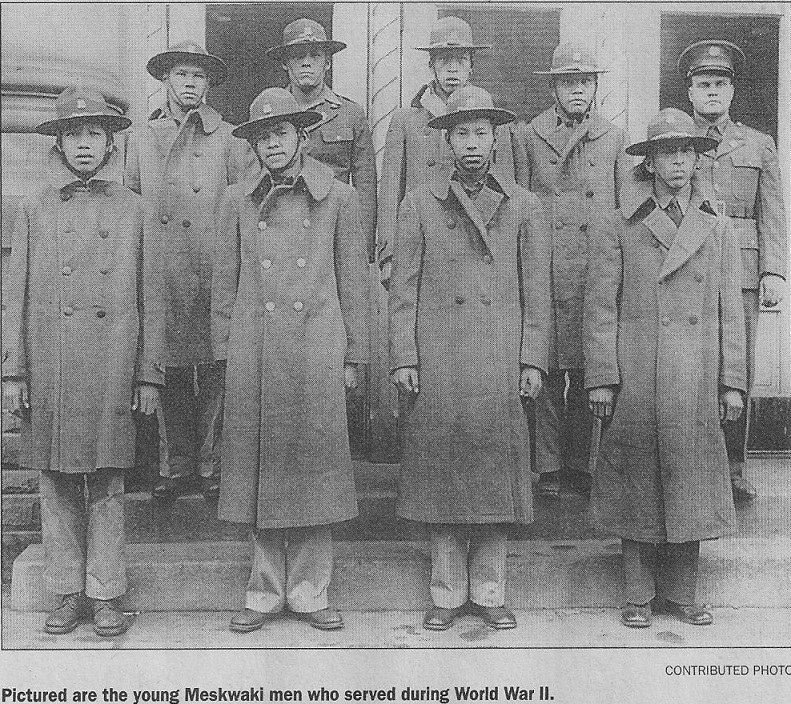 The Meskwaki code talkers were recruited in a special program in February 1941. Twenty-seven started the program and eight graduated. They were not aware of any other tribes recruited this way. They spent the week in training locally at the Marshalltown Coliseum ; physical and wilderness training was by hiking to the neighboring town of Albion and camping along the river. The went home to the Meskwaki Settlement on weekends. Once the U.S. was in the war, they were sent to Louisiana swamps for Army integration and the eight were sent to England and then to participate in the North African invasion, Nov 1942. At the Battle of Kesserine Pass, the first big U.S. battle against Rommel, in which the US Army was soundly whipped, the unit the code talkers were with ran out of ammunition and were told to disperse -- every man for himself and don't get caught. They headed south into the desert. The Air Force was supposed to provide search and rescue. The code talkers came out of hiding to wave at a passing U.S. plane, but it was followed by a German plane that reported their position and three of the eight were captured and spent the war as POWs -- Dewey Youngbear, Frank Santhe, Jude Wayne. Actually three were brothers named Wabaunasce, shortened in the Army to John Wayne, Mike Wayne and the captive, Jude Wayne. The remaining five continued code talking until the North African victory, then on to Sicily, Italy and France. One died of sickness and seven came home only when the war was over. Back to WW2Pacific home page. About this page : Codetalker -- an interesting aspect of the war.